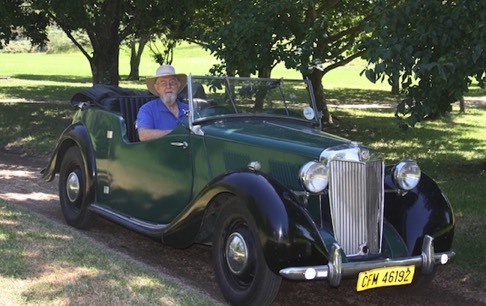 Vintage cars are lovely, I once had the immense pleasure of driving a beautifully restored 1946 MG-YT cabriolet. It was a fast car in its day, a top speed of 80 mph, a speed I wouldn't dare go anywhere near. But why? Because its brakes are far less effective than modern cars! I went straight through one intersection to start with because I'm used to today's considerably more powerful brakes! The 30 mph speed limit in urban areas was introduced in the UK many, many years ago - way back in 1930. At that time, I now know that such a low speed was really needed but, close to a century later, it continues unchanged despite enormous improvements in car design, safety and, especially, car braking systems. Does driving at a safe speed in good conditions cause accidents? No. Does all speed cause accidents? No. But do dangerously high speeds for the current road conditions and vehicle cause accidents? Yes. The earth goes round the sun at many millions of miles an hour, yet this speed does not kill. Airplanes go at hundreds of miles an hour, yet air travel is one of the safest forms of travel. So does speed itself kill? No, absolutely not. What is actually true that inappropriate speed for the prevailing conditions can kill. This is NOT to encourage any form of inappropriate speed. Do NOT drive fast near schools, children or pedestrians! But safe driving at a speed which is entirely appropriate for the conditions does not kill, no matter whether faster than the posted speed limit or not. Always drive safely according to the prevailing conditions. 2. Does Speed Cause Accidents? The number of road casualties does indeed need to be minimized, but telling obvious untruths does not help. It's a little known law of nature that the result of an idea is never separate from its source. This means that the good does not and cannot result from the bad in the long-term. Driving at any speed which is NOT appropriate for the conditions is unsafe, whether that speed is slower or faster than the posted speed limit is irrelevant. Unsafe driving is dangerous! Whenever drivers see the speed limit is too low, the natural incentive is to ignore it. An unfortunate but inevitable consequence is they teach otherwise law-abiding citizens to disregard the law. Some even see disregard for the law as encouraging corruption in politicians and police. The UK government has itself cautioned that setting speed limits that are "unrealistically low" leads to disrespect for the law. It also reports that 95% of all drivers admit to exceeding speed limits . The temptations given by historical hang-overs such as unrealistically slow highway speed limits - started a half-century ago - and the 30 mph limit in towns, unchanged since 1930, regrettably encourage police to focus on revenue collection rather than their core responsibility: ensuring the safety of citizens and their property. Nobody in their right mind is in favor of dangerous driving - it causes accidents! Motor vehicle accidents are fourth on the top ten annual killers list in the USA, killing three times more people than guns. This analysis of ineffective and widely ignored speed limits is not to be seen as encouragement for dangerous driving. 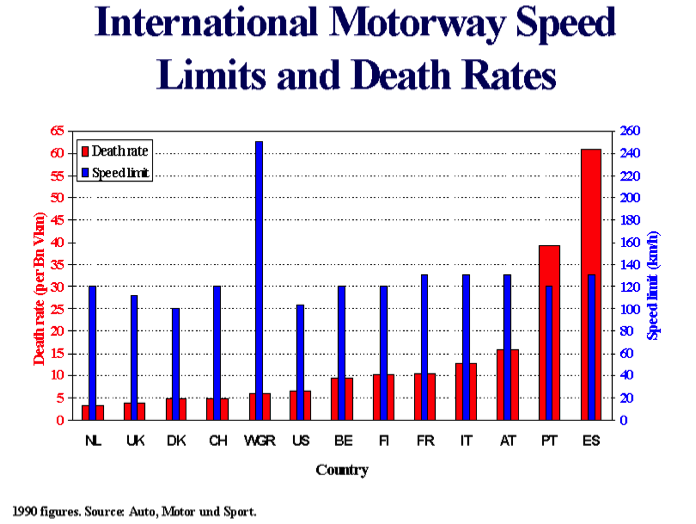 This comparison (expandable) shows that Germany's autobahns, with a 150 mph speed limit on some but by no means all highways, are safer than most countries' with stringent limits - including the USA. Every road has a safe speed at which good drivers with safe cars travel in good conditions. The current natural safe speed of most roads has been estimated at some 50% higher than its speed limit. 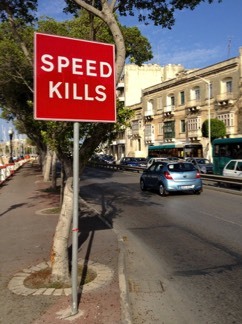 Some insightful campaigners recognize this which has lead to a few cautious attempts to raise speed limits . Faster speeds when it's safe buy drivers time to slow down when less safe. Victimless crime can have a large impact on police activity, which can mean they don't focus on their primary task, protecting your children, you, and your property . Penalizing safe driving at speed is just another counter-productive and costly regulation that wastes countless man-hours with virtually no impact on accidents. Some officials have given police revenues quotas for speeding fines, and their honest police officers are fighting the quotas, see here, here, and here . There are even mayors who attempt to mislead the public, denying they have imposed illegal quotas by calling them "performance measurements" instead. see here and here . What's actually needed to decrease fatal accidents is not to focus on speed limits, but on what actually causes accidents - dangerous and reckless driving - which is very different. Instead of ignoring the search warrant affidavit for the bomb making perpetrator , the police would then be able to focus on protecting you and your children from massacres like Columbine and Sandy Hook.